These are cysts at the end of the small airways within the lung. There may be many small cysts, giving the lung a honeycomb appearance on X-ray, or there may be one or two large cysts. Cysts in the lung usually drain poorly and cause chronic infections. Most babies with these cysts have respiratory distress. Surgical removal of the affected lobe is the treatment. The surgeon will try to remove as little of the remaining healthy lung tissue as possible. This is a malformation of the diaphragm, which separates the chest from the abdomen. Usually with this condition, the diaphragm either is missing or has a hole in it. As a result, the organs in the abdomen – the stomach, liver, and so on – can drift into the chest cavity, leaving little room for the lungs to expand during breathing. Repair of the diaphragm is accomplished with surgery. This is a malformation that causes overinflation of one of the lobes of the lungs. This becomes a problem because the overinflated lung takes up more space than it should and therefore interferes with the regular inflation of the rest of the lung. Surgery is the treatment for this condition. This is an underdevelopment of the alveoli, airways, and blood vessels in the lung. There is a spectrum of severity of this abnormality. Babies born with this condition may need to be put on a ventilator. They may need to be given a substance called surfactant, which is a foamy, fatty liquid required to keep the air sacs open so that the baby can breathe. Pulmonary hypoplasia is most often associated with premature rupture of the fetal membranes before the 24th week of pregnancy. This is an area of lung tissue that is not connected to the airways of the lung. This extra lung tissue has no function. The abnormality may be within or outside the lung. A pulmonary sequestration may cause breathing problems, or there may not be any symptoms at all. Surgery may be required to remove a pulmonary sequestration. 1... 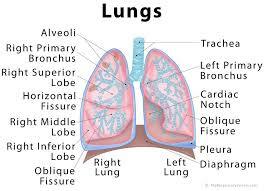 Lung formation is before birth the child. 3... I told U many times that our lungs can take 6 Lts of Oxygen per minute.. The Oxygen is needed to digest your food, purification of blood of your body etc.... Remaining oxygen only reaches to your unborn baby to develop his lungs. 4... Select the food which will consume minimum oxygen for your body needs and digestion so that the remaining will be useful to your unborn child.